Well, I did it and the results are in. Both yarns shrank the same! My experiment was a flop. So much for that experiment. Oh bummer! It's quite pretty though even if it didn't shrink so why not finish it. Maybe Catzee's cloth took on those special feline powers to do just what it wants. It is a pretty cloth. 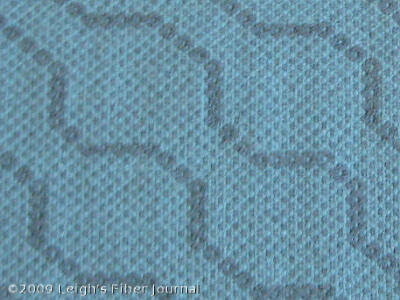 I bet if you did stripes of rayon vs. cotton you'd see some of a seersucker effect from the differetial shrinkage. When I've been playing with differential shrinkage, I've found that it helps to open up the sett to allow the "shrinkers" to move in the fulling process. I like the fabric, although it didn't shrink. I understand that this is quite a disappointment after all the research you have done. Do you have any idea why it din't work out? No, Leigh, your experiment was not a flop. If it has been a flop it would have taught you nothing. You learned that these two fibers do not shrink differently enough to do what you planned. 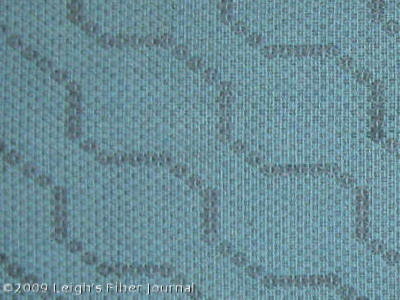 You learned that you can use these two fibers together in regular weaving projects. You may have learned other things as well. Oh dear... but it's a beautiful failure! Perhaps if there was stripes instead of a wandering pattern? I agree about having a more open sett. That means the threads can move more during wet finishing. Have you thought of washing it again, hotter? Just to check? The second year students just finished double weave and some of them experimented with differential shrinkage and the results were amazing! They mostly played with silk ,sett at 28 EPI, and merino, sett at 7 EPI. The finished fabrics were shrunk in the washing machine. One lass made what she thought would be a nice sized cowel but after shrinkage ended up with a beautiful piece of fabric that would not fit over her head. Not having the mental image that she started out with, the rest of us were able to...love would not be too strong a word, the resulting product. But alas, in her mind, it shrunk too much. Marvelous failures are sometimes the best teachers. If only we can look past the failure part. Even failure teaches us something... maybe a different weave structure, or sometimes the dyes can even affect shrinkage (think bleached white fleece). This is just data in a lovely shape! I thought about a more open sett as well. My adjustment was to try the sett I've been using, but with a slightly finer yarn. Certainly not a failure if we've learned something from it and even more so when you shared it with us so we all can learn. So many good comments and ideas have already been expressed. I wanted to let you know that I enjoy reading about your weaving experiments and think that this summer and winter is a beauty. I love your dig in a find the answer attitude, it makes me think! I like the way it looks. It's just like in school, isn't it. You have a thesis, do the research, get an answer that doesn't support your thesis, revise your thesis, revise your answer. You never left school! I am a firm believer that no experiment is a flop. If we learn one thing, or it starts us to question how we did something or even send us in another direction, then it was a success.